Roald Dahl, Mark Twain, Virginia Woolf, George Bernard Shaw, Dylan Thomas, Michael Pollan, and Henry David Thoreau. All noted authors or poets but they had one more thing in common they all had writing sheds. For these authors their writing sheds was a way they could get away from distractions and focus on their writing. Michael Pollan was quoted as calling his shed “a place of solitude a few steps off the beaten track of everyday life.” These sheds were actual converted storage sheds or sometimes cottages and huts. George Bernard Shaw actually outfitted his with a turntable so he could push it towards the sun as it moved during the day for natural light. I currently write at a small desk in the sun room of my apartment but it’s a shared space so it’s not very private. My roommate aka my Dad also uses the desk so his mail tends make it’s home there. I have a desk in my room but I find it to be suffocating and too distracting. 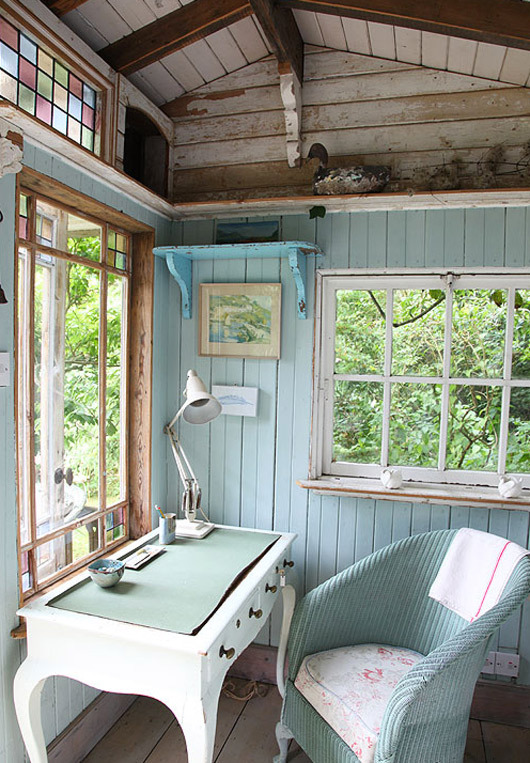 I dream of having a writing shed of my own someday nestled away in a garden. With big windows, a small couch and a desk. Some where I can be alone with my thoughts with only the sounds of nature. No traffic, no neighbors, just sweet sweet solitude.